Pacsafe is probably best known in the outdoor world for its anti-theft backpack protectors, but the brand also has an extensive range of bags and rucksacks designed with protection against crime. It’s a sad fact of life that theft is a risk for travellers, whether at home or abroad. Pacsafe sent us this little 15 litre pack which not only has a host of features to prevent crime, but also to keep your precious items safe from the weather. The pack is made from very tough-feeling 1,000 denier nylon and 900 denier polyester with a 0.15mm TPU layer. The whole body of the pack has a buried eXomesh slash-guard system. This is a metal mesh designed to deter thieves who might simply take a knife to your bag to gain access to your valuables. Access to the single large compartment of the pack is via a roll-top closure. 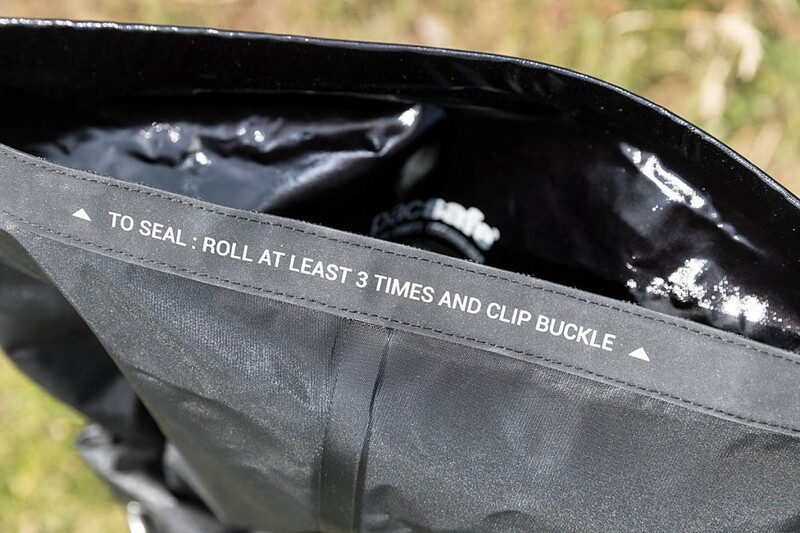 Three turns on the closure and clipping the plastic buckles together will give IPX6 protection, which will guard against water ingress from rain, splashes and such like, though it’s important to emphasise that it isn’t designed for immersion. Inside the main compartment is a small, zipped pocket that has RFID protection, so it shouldn’t be possible to skim bank cards or passports while they’re in the pouch. There’s also a key clip. 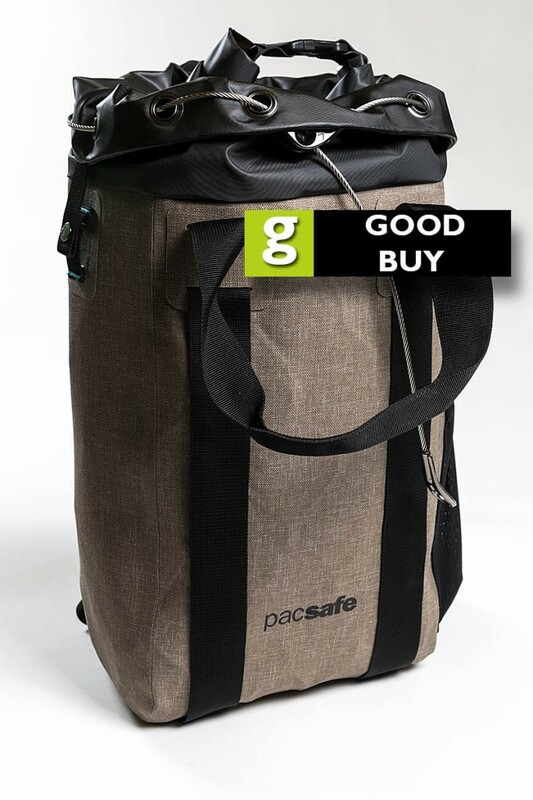 The Pacsafe Dry 15L also has a very useful anti-theft device that allows the pack to be secured to a fixture wherever you are. A metal cord runs through a series of eyelets in the top of the bag. This is cinched tight so a metal bead in the cable sits in a recess. You can then pass the shackle of the supplied padlock to lock the whole thing in place and prevent it being snatched. The three-figure combination on the padlock can be set with your own choice of numbers. The pack also has an external stretch mesh pouch for a drink bottle. When fastened, the roll-top stands quite proud of the top rim of the pack, but it can be pushed down to make things a little neater. There are two loops with press-stud fastening to help keep the outer rim folded down. 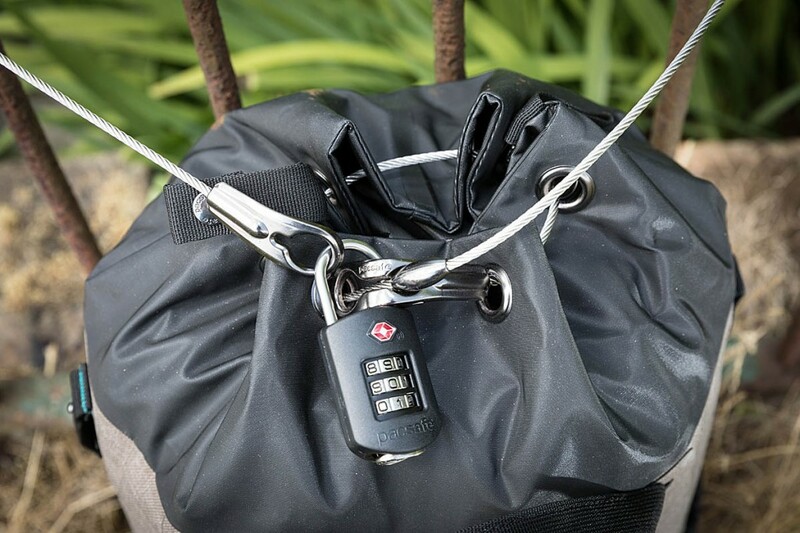 To secure the bag using the locking device, we found it was necessary to raise the top edge of the pack to enable the metal cable to be cinched enough to be engaged in the locking mechanism. Once that’s done, however, not only is the pack harder to walk away with, but the closure is also secured. The harness is fairly basic. 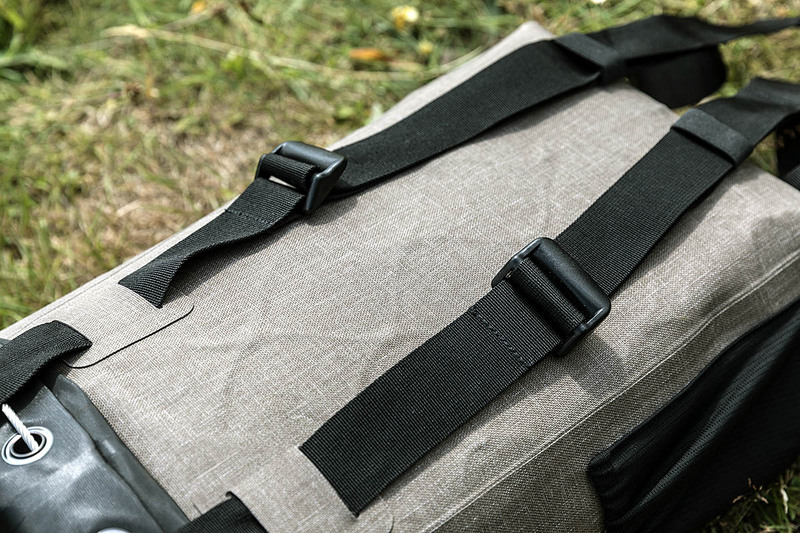 The two shoulder straps are actually part of a continuous webbing system that passes under the pack and also incorporates two grab or haul handles back and front. There are plastic buckle adjusters for length and elasticated loops to keep excess strapping tidy. There’s no padding in the harness straps and the webbing was just wide enough to spread the load reasonably well. There’s no padding in the back of the pack either, so don’t expect the kind of comfort and ventilation you might get in a technical outdoors rucksack. The inner lining of the pack is black, which makes it difficult to see into the bottom of the bag. We often carry around expensive camera gear and it’s comforting to know the various security aspects of the Pacsafe pack were helping to keep it safe. Its 15-litre capacity is fairly small, but we managed to fit in a camera body with two zoom lenses, along with a softshell jacket, waterproof jacket and a bag of bits-and-bobs that goes everywhere with us when we’re in the outdoors. Obvious uses for the Pacsafe Dry 15L are the beach, or water activities on the hills where you might need to secure your valuables while you splash around having fun, though remember it’s not meant to be immersed. The Dry 15L will keep out the rain too, so urban trips in the wet are another use for the pack. Material and construction, as well as design, are very good. The pack feels very robust, a fact reflected in the relatively high weight for a small pack and the high price. 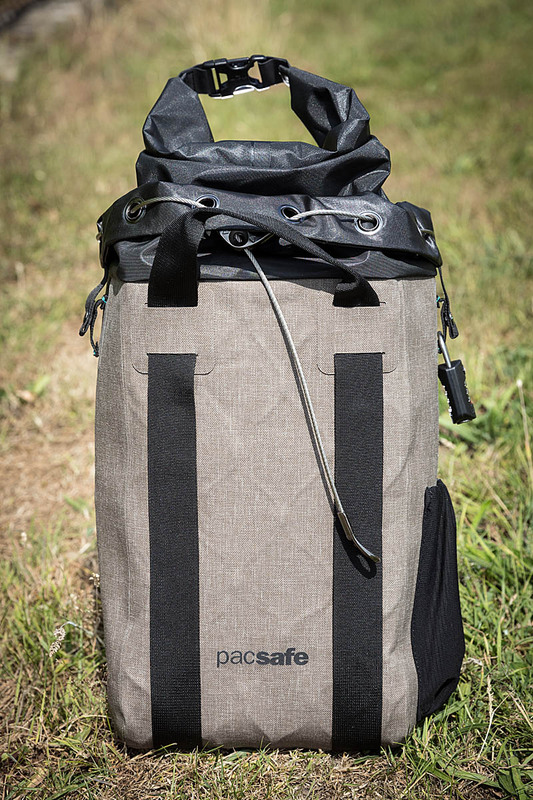 But the fear of theft is a worry for many going about their lives, and the Pacsafe Dry 15L guards against this while also keeping your gear dry. More details are on the Pacsafe website.